Aboriginal culture is central to health. It is value based, built on social roles, cultural obligations and responsibilities which differs to the dominant western health system. During clinical interactions these opposing worldviews collide leaving the patient no wiser on their disease management or follow up plan. So, what does a culturally competent model of self-management look like for people with acute rheumatic fever (ARF) and rheumatic heart disease (RHD)? Vicki Wade, RHDAustralia's Cultural Lead presented her findings of a recent desk top review on self-management for Aboriginal and Torres Strait Islander peoples with ARF and RHD at the annual National Aboriginal Community Controlled Health Organisation (NACCHO) conference in Canberra on the 1st November. Her presentation Culture, Communication, Clinical Interactions: factors for change in chronic disease self-management was a synopsis of her findings. The review looked at what is needed to make self-management successful in Aboriginal and Torres Strait Islander peoples with ARF and RHD. It was apparent from the review that the development and use of resources cannot occur in isolation. For resources and tools to be implemented successfully, an integrated systems-wide approach with a solid framework that supports the uptake of resources and tools is needed. 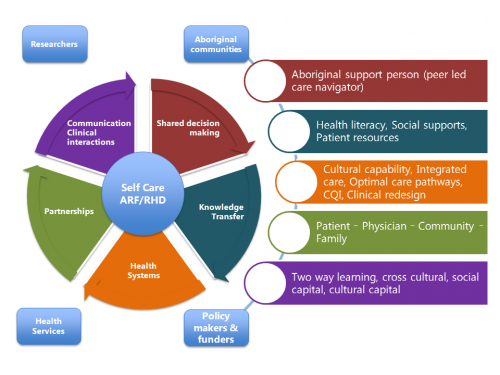 The development of a toolkit for self-management support for Aboriginal and Torres Strait Islander peoples with ARF and RHD is a key area of work for RHDAustralia in 2018. Self -management support is the assistance caregivers give to patients with chronic disease in order to encourage daily decisions that improve health-related behaviors and clinical outcomes. Self-management support may be viewed in two ways: as a portfolio of techniques and tools that help patients choose healthy behaviors; and as a fundamental transformation of the patient-caregiver relationship into a collaborative partnership... The purpose of self-management support is to aid and inspire patients to become informed about their conditions and take an active role in their treatment. In her abstract, Vicki explained that Aboriginal and Torres Strait Islander peoples suffer everyday from a disease that has been eliminated in all other developed countries in the world. ARF and RHD present many challenges along the entire disease trajectory. If not treated promptly and correctly ARF can develop into RHD, a chronic disease that can cause a lifetime of suffering and pain. How best to manage chronic disease, including self-management support, for Aboriginal and Torres Strait Islander peoples has been a struggle for decades, with a question mark remaining over the effectiveness of current programs.